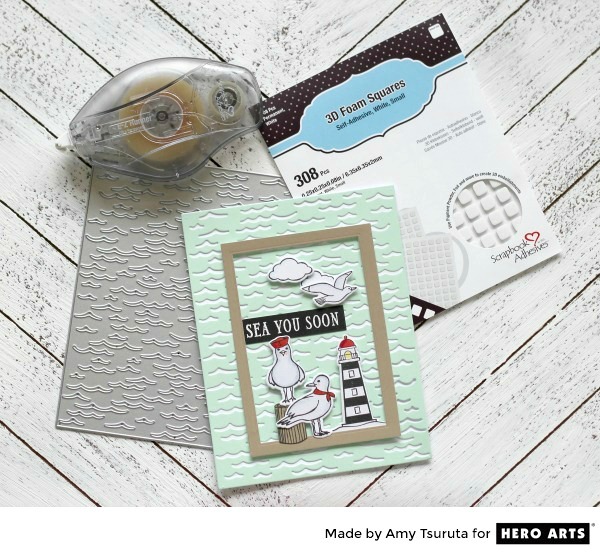 Hello and so happy that you're joining us for the Scrapbook Adhesives by 3L® + Hero Arts Blog Hop! You should have arrived here from the Hero Arts blog! If not, you'll want to start at the beginning which is the Scrapbook Adhesives by 3L®. 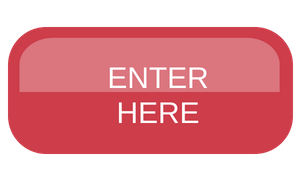 Prize info: There will be two prize packs, drawn from the entries collected on Rafflecopter. 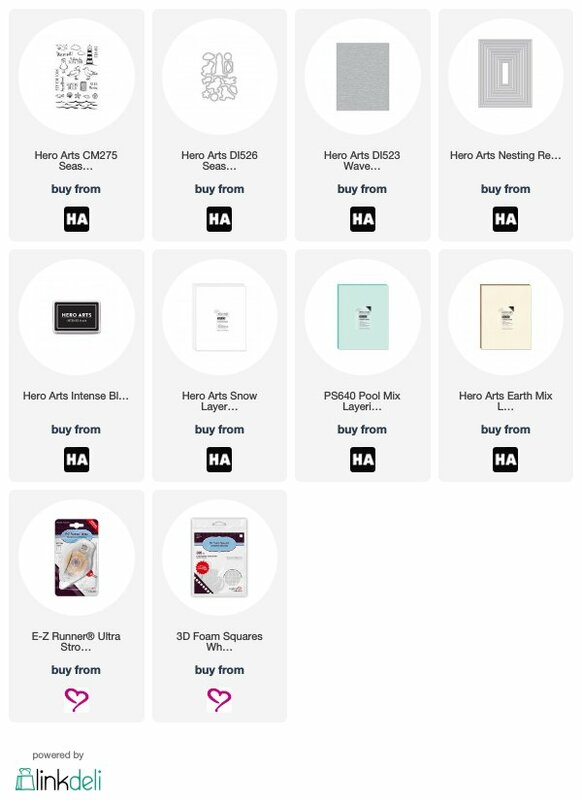 One prize pack from Hero Arts, one from Scrapbook Adhesives by 3L®. Let me start by saying that I've been a long time fan of Scrapbook Adhesives by 3L®. It is my personal adhesive of choice and I use their products every time I craft! Let's start at the bottom and work our way up! I used a panel from the Pool Mix Layering Papers with the DI523 Wave & Sea Confetti Die. I used the E-Z Runner® Ultra Strong Refillable Dispenser to adhered the die cut panel to my card base. This is a clear adhesive and perfect for this part of my project. I stamped a bunch of images form the CM276 Seas The Day Seagulls set. I colored them with alcohol markers and then used the coordinating DI526 Seas the Day Seagulls Frame Cuts. I'm a HUGE fan of all of the Hero Arts Infinity Dies. Why? You literally grab one set and you have all the different sizes to accomplish what you want. That frame was made with a panel from the Earth Mix Layering Papers. I used two of the Nesting Rectangle Infinity Dies. They've been adhered to the base with 3D Foam Squares White Small Size. I finished up my card with placing the different colored images onto my card using the same adhesive, 3D Foam Squares White Small Size. Loveeeeeee this! LOVING those birds!!!!!!!!!!! 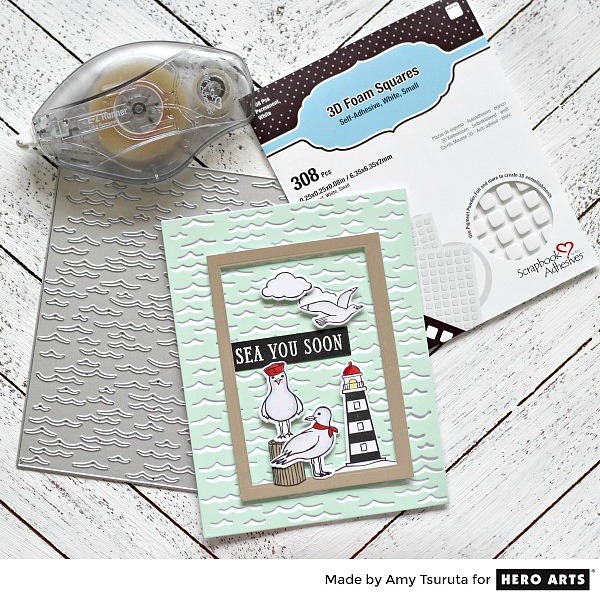 Love your seagull card and I too love Scrapbook Adhesives and use their products for almost every card I make! I love scrapbook adhesives! Love these cards and the background layers. So sweet! Love this unique card... the die cut cover piece is awesome... and I love how everything pops up! Adorable card. Love the background die! Adorable card, just love it !! Thanks for sharing. Fun card! Those foam squares look very handy! Very cute. I like the framing. How adorable is this? Love it! 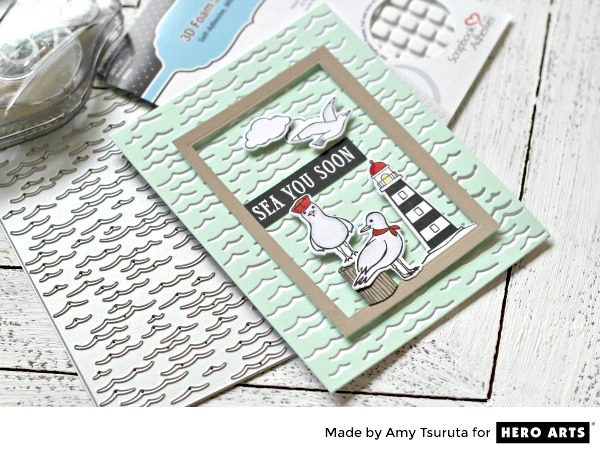 Love the sea gulls and the embossing folder. Darling card. I'm happy to find out about Scrapbook Adhesives. THanks for sharing. Great color choices.. Love the card design! Darling card, love this set and the dimension with the foam squares. The whole card is so nice filled with lovely techniques...thanks for sharing!! cute card! pool mix layering paper is a gorgeous color choice! Those gulls are the cutest!! My daughters mother-in-law lives on the east coast. She would love this card! So pretty! Love the layering and colors! That is one cool cover plate and I love your subdued color choices, Amy. Just love this HA release. Great card! I love all the layers!!! Such an adorable card! I like the seaside theme. Great card! Love that background die and the seagulls are adorable! Cute, cute. Love the sentiment. Love your sweet card, Amy! That wave die though....very cool! LOVE this card! Those Seagulls are absolutely adorable! And the soft green background is just amazing behind them! I am in LOve with the thin version of these squares, amy … and every single fantastic element of your darling card! love the use of foam squares to raise up portions and the tape runner to adhere the rest great card! Love the background, it is perfect for this card! Oh my!!! I love every single detail on this card, Amy!! The images, the colors, that fantastic cover plate, the layout!!! Such a perfect combination! Super fun sea-n! I love how you've used the background and the frame!!! Thanks so much for sharing! I love the wave and sea die by Hero Arts. It makes a great backdrop for those sweet seagulls. I think the one with the bandana around his neck is adorable! The foam dots are favorites of mine and make assembling a card so easy. Thanks for sharing. Great card. I LOVED that background!! This is so pretty! Love the green background! Fabulous card! I love the waves background! Wow! Awesome scene! 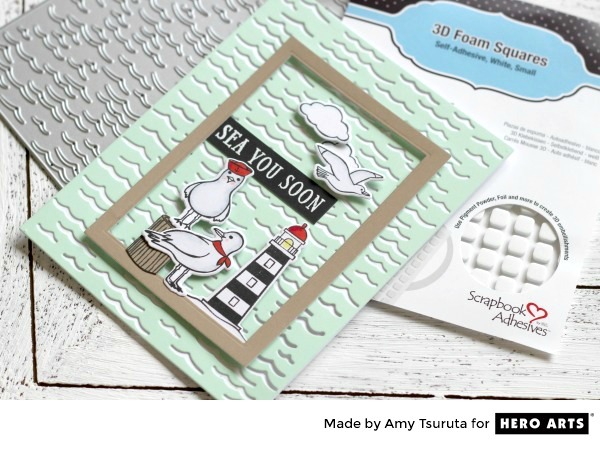 Love the seagulls and the stunning embossing folder! The waves die is fab, as are the stylish seagulls. Love the waves die. Just what I need for summer crafts. Cute card! Love the waves! I LOVE your card!! Nautical is so sweet and timeless! And WHO doesn't love the ocean?? Thank you for sharing! The color combinations on this card is so pretty. I like the background waves. Love your card! I am in love with that background waves die! It adds so much to the card! Coolest background, just adore this!